Small robots are cool, big robots are awesome. A few years ago, I met this cool guy, who happens to be a wonderful artist : Romain Lardanchet. He does these sculptures where he takes parts of scooters / motorbikes / quad, re-interpret them to look like living thing, a process he calls "mechamorphosis" ^^. When I met him, he had this awesome 3m long mechanical panther with him, Agheera. The idea to work together on making something like that move immediately came to mind, sparks flew, and a year and a half later (December 2013), when we finally could find some time off from the rest of our busy lives, we started working on something together. The result is Aringer, a saber-tooth tiger with an animated head. He did the body, we made the head together, and another talented friend made the beast purr, growl and roar. WARNING annoying sound, turn your speakers down. The head can move left and right, the 2 pairs of ears move up or down (a little like the beasts in Avatar! ), the eyes glow, the lips move up and down. The "breathing" of the gills-like things was removed later due to the annoying sound. The head moves left and right to follow the people in front of it thanks, and it will have different behaviors depending on the distance of the closest obstacle, from purring to threatening growl, to full on roaring for intimidation! Lots of stuff is going to happen in the 3 remaining months of this year. Lots of traveling, new Xevelabs products, multiple robotics and electronics-related events. I'll also be around at the following Maker Faire Rome! I'll have prototypes of my new products with me, but saddely nothing very sparky. I'll bring the USB2LDS (interface for the Neato LDS lidar sensor), an adapter board that makes it possible to string XL servos after AX/MX servos, and an interface for other types of servos. Later in October, I'll be at Robot World in Seoul. One of the biggest robot event in the world! I recently posted about the new XL-320 servos by Robotis. I got 4 of these, and thought I should do a quick demo with them before the long and grueling groundwork that will be needed to integrate them in my new robot which will mix AX and XL servos. So here is GlitchBot, a little walker robot. It uses 3 XL-320 servos, the OpenCM9.04 and OLLO parts exclusively. The design is based on Tictac6 / Twitch / TwitchMX robots. It's basically a 3-servos hexapod that is in fact more of a biped, depending on how you look. The principle is simple enough: one servo to rotate each leg, and one to swap which trio of feet is on the ground, with a deformable parallelogram configuration to keep the legs parallel to each other. Each leg is made primarily with one of the batteries, put as close as possible. Flex in the material is taken into account to keep the bot level when it is standing on one trio of leg. One leg up... there's enough clearance, it's all good! There is a little glitch sometimes where a command is not executed (which results in this video in the turn, near the end)... I guess the bot is aptly named ^^' I'll have to investigate. More technical discussions in this thread on Trossen Robotics Forum. I received recently some Dynamixel XL-320 servos for beta-tesing. These are the new mini servos of Robotis' Dynamixel family. They are intended to be used for small robots that do not need a lot of torque, like the cute Darwin-Mini. Yet, what I would really love to do with them is to put them on a bigger robot, with AX and MX servos altogether. I envision a bot where joints could have the proper size of actuator, all the way from the MX-106 for knees and load baring joints to the XL-320 for fingers, sensors, or cosmetic movements (let's make the ears of Darwin-OP wiggle!). they use the newer Dynamixel Protocol v2.0, same as the much much bigger Dynamixel Pro. (This was not the case for some earlier beta testers, but since the support website page has been changed, I believe it's going to stay like that from now on). they do not have regular mounting holes for M2 screws, they are intended to fit with OLLO plastic parts and their plastic rivets, meaning they have 4mm holes every 6mm (where AX have 2mm holes every 8mm, and MX have a variety of (non-compatible >_<) hole patterns). When it comes to the first and second problems, a solution can be found with an adapter board. Aaron Perkins did just that, and I intend to make one too at some point - a smaller and less expensive one though. The third one is not that bad, since commands in both protocols can be sent in turn on the same line, and there is no risk of misunderstanding. Only difficulty is that the master has to be able to speak fluently in both protocols. When it comes to interfacing the servos mechanically with other stuff, there are multiple ways to go at it. The most obvious would be to use OLLO parts and rivets, just as intended, but this is not compatible with AX/MX servos, and there is a lot of give in every assembly. Rivets are great for small fun robots or prototyping but n match for screws when you want the thing to stay like that and not wobble around. In the Bioloid Premium kit, they use a few OLLO-compatible parts, for example in the head to fit the ZIG-110A radio module. This is achieved with what look like M2.5 thermoplastic screws. They have a head with a diameter of 4.3mm, which is enough not to go through the 4mm holes of the OLLO parts. M2 screws have flat heads around 3.6mm of diameter, but with the help of a small M2 washer (diam 5mm), they can be used to bolt the OLLO parts to regular AX parts. 5mm happens to be exactly the size of the small recess in the parts, in which the shoulder of the rivet usually fits. I guess I'll work on some 3D printed mechanical adapter parts. 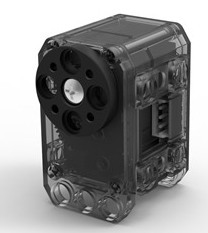 The gearbox is 100% plastic, even the motor gear. However, there is a nice feature on the output gear: a torque limiter (the sort of double lobe thingy inside the biggest gear in the photo). This should make breaking the gears less likely in case of shock (like having a robot fall from a table). The build quality is really good, the architecture is no-fuss, with one PCB on which the motor, STM8 microcontroller and potentiometer are soldered directly. The sensor is an old-school potentiometer, like the good-old AX servos. There is enough room to put a magnetic sensor like in the MX servos, but the price would have certainly been much higher - such sensors cost maybe $4 more than the potentiometer, and I'm not even counting the magnet and increase of assembly and testing cost. Here are the references of the connectors for the XL-320 (that can be found also here). The updated firmware guide is available on the documentation wiki! Recently, I got reports of USB2AX units that did not function properly with Robotis' Dynamixel wizard. Those were brand new units, and multiple simultaneous hardware failures seemed unlikely. Time to investigate. On my computer, nothing strange, as always, the famous "It works for me" syndrome. However, I noticed that a RoboPlus update was available, and, thinking nothing of it, I started downloading it while searching for a way to repeat the problem at home. As you might have already guessed, the new version of RoboPlus turned out to be the trigger element, and what is comes down to is the addition of support for Dynamixel PROs. It appears that the Dynamixel PRO line uses a different protocol named Dynamixel 2.0. This protocol is more complex than DXL 1.0, with more header bytes (4! ), longer adresses (2 bytes) and longer CRC (2 bytes), and a lot of new commands and cool features. The fun thing with the Dynamixel Wizard is that even when you want it to search for DXl 1.0 devices, it sends a DXL 2.0 broadcast ping. And this ping looks like a DXL 1.0 packet addressed to 0xFD (the id used by the USB2AX), with a length of 0 bytes (which does not play well with DXL 1.0 as it's supposed to be >= 2), and a command ID of 0xFE. As Murphy's law dictates, this ping 2.0 just so happened to fall in what seems to be the only place in the USB2AX parsing state machine where it could be stuck... which explains that after that, nothing would work anymore. This is a good reminder why testing inputs with fuzzing techniques and trying to make completely fool-proof input parsing code is important. Luck has it that something will always happen to your program fail even when it is very unlikely. 2) There shall be Light, and there was Light. The wires run inside the aluminum profile so as not to pose any problem when folding the machine. Hey, long time not see. It's been a busy year. Things are moving again though :) Let's dive in! The most important news is that I am now the owner of a 3D printer, a Foldarap. It's a RepRap that has the cool feature of being foldable to the size of a briefcase. I got the "peer to peer" package of the ulule crowdfunding campaign, and had a friend print me the parts on his Solidoodle. This printer comes as a kit that cost me 500€, plus the parts I had my friend print. So instead of re-printing anything, I carved the inside of each part with a Dremel and a small end-mill. Around 3h later I had all the parts down to size. At some point, I realized one of the parts (the one that holds the extruder motor) was not the right one, I had the old model that accommodated a geared stepper, whereas my kit had the hardware to mount an extruder with a direct drive NEMA 14. Of course, the holes did not match, I had to modify the part... but it turned out OK, I have found the proper way to tighten everything and haven't even changed it since. The rest of the build went smoothly (well apart from when I made silly mistakes like mounting the plate that supports the bed upside down...), it's a great kit! I started printing right away, and while the first print started very well, it turned to crap after before the end. The causes were that the temperature sensor was not mounted properly (the cable sometimes lost contact! ), plus my inexperience that made me select an extruder temperature too low (190°C). Currently, I stopped using the heat bed, and put some UHU glue on it to get that damn 1st layer to stick. Now it sticks all right, maybe a little too much. Also, I now extrude at around 210°C, which gives me an awesome cohesion between layers. I still haven't mastered it, but I get acceptable results, sometimes :p. It's a long road, but at least now I'm walking it instead of sitting on the side! At least I made the right choice to come this year. It has been a blast, I met a lot of very cool people, got to show Xachikoma and the USB2AX to a lot of people and overall had a lot of fun! With Kyle from Trossen Robotics we even had Xachi walk a PhantomX AX quadruped at the end of a leash, it was pretty cool! I have said to a lot of people that I would publish the code that I use in Xachikoma. This code has always been under an open source license, but around the first contest I entered Xachi in, it immediately became apparent that I needed to find a way to get version control even when I don't have access to the internet. At the time, I was very new to Git and so were the people who tried to help me, so the solution that our guardian angel Alex set up for me was to run a SVN repository on the robot itself. After all, the robot is the only common denominator in every situation I have been in. The result is that in these two years, the code evolved far away from the internet and thus from the reach of the Internet dwellers. While I might transition to git at some point, for now i'm just going to post a source package so that people can have a look, and I'll try to setup a better workflow at a later date, if it ever proves useful. In the meantime, have fun! I'm going to Robogames 2013 with Xachikoma, April, 19-21 in San Mateo! This is gonna be LEGEN.... wait for it... DARY! Officially a Fan of Open Hardware!